Construction sites in the Lafayette area can be dangerous for workers, pedestrians, bystanders, and people outside the construction site. Lafayette work sites contain dangerous materials, deadly machines, unsound structures and hidden hazards. While many Lafayette businesses take great efforts to ensure the safety of workers and bystanders, shortcuts are often taken, exposing you to unnecessary risks. Whether you fall on something or something falls on you, Lafayette Construction Accident Lawyers are here to help you. What is Lafayette Premises Liability and how can being injured in a Lafayette Slip & Fall accident affect you? In layman's terms, a "slip and fall" or "trip and fall" means getting hurt on someone else's property, usually because of some negligence in maintaining or constructing the property or something on it. Legally, these types of injuries are part of a broad body of law known as Premises Liability. These types of accidents are very likely to happen on a construction site because of uneven surfaces, poor lighting, temporary walkways, and unmarked dangers. There is also a risk of falling debris or materials and even explosions. 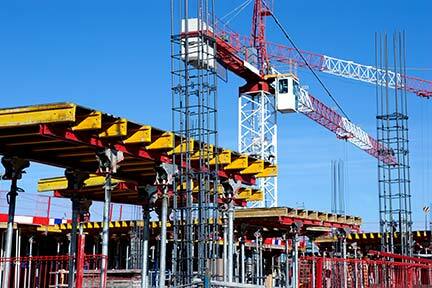 Contractors and property owners may be held liable for nearly any type of injury suffered on a construction site. In some cases, these parties even have a duty to warn you of dangers. A Lafayette construction site injury lawyer can help you with these types of claims as well as claims for any other type of injury suffered on or because of a construction site. Lafayette Area Temporary Labor Resources - Find Workers or a Job. Workers' Compensation law is designed to allow an injured worker to recover regardless of whether the employer was directly responsible for the injury or not. Lafayette Workers comp is, in essence a "no-fault" law in that even if the employee is "at fault" for their injury, this is not relevant to your right to work comp benefits. As long as the injury was (1) incurred within the course & scope of employment and (2) the employer maintains workers comp insurance, the injured worker will be entitled to payment. Louisiana Law requires that nearly all construction contractors purchase Workers' Compensation insurance. Some farms are not included. Domestic Employees are never included. Those that do not purchase insurance can be held responsible for paying the full damages suffered by their employees if they fail to pay you the amount that Workers' Compensation would pay. You may be able to recover more if your employer does not have insurance, but typically you will need to hire a Lafayette Worker's Compensation lawyer because you are likely to encounter a legal battle if your employer has no workers' compensation insurance. If you or a family member has been hurt on the job or has suffered a workplace related injury, please contact one of the experienced Lafayette Workers' Comp lawyers listed on this page to help you get through the complicated paperwork and red tape associated with claims for workers' compensation benefits. In Louisiana, injured employees should report injuries to their employer within 30 days, or they risk losing benefits. If an injury develops later, special rules may apply, but the employee should report it as quickly as possible. Contact a Lafayette Construction Workers' Compensation Attorney or Construction Labor Lawyer in Lafayette quickly to make sure you receive the benefits you could be entitled to. 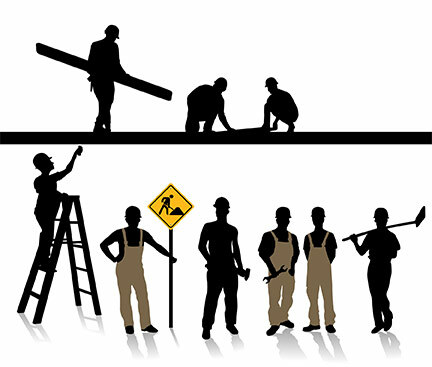 Over 11 million construction workers build and maintain roads, houses, workplaces and physical infrastructure. This work includes many inherently hazardous tasks and conditions such as work at height, excavations, noise, dust, power tools and equipment, confined spaces, and electricity. Construction has about 8% of U.S. workers, but 22% of the fatalities - the largest number of fatalities reported for any of industry sector. Nearly 3.1 million nonfatal workplace injuries and illnesses were reported among private industry employers in 2010, resulting in an incidence rate of 3.5 cases per 100 equivalent full-time workers. These statistics do not include all of the workers injured in construction industry nationwide. Every day employees lose limbs, suffer deep lacerations, broken bones, brain injuries and more as the result of accidents on the work site. According to OSHA statistics, 16 Louisiana construction workers were killed in 2010 alone. Lafayette worksite injury lawyers work with injured workers to preserve their rights to full medical services and financial compensation for lost wages, medical bills, future lost wages, disability, disfigurement, and more. Find a Lafayette Construction Accident Lawyer, a Lafayette Personal Injury Lawyer, or a Lafayette Premises Liability Lawyer now! All of the qualified Lafayette construction site injury attorneys listed at the top of this page have experience dealing with "slip and fall" accidents as well as other types of premises liability lawsuits. These lawyers will zealously pursue your claim in Lafayette proper or in Lafayette neighborhoods and surrounding areas. Serving clients throughout Southern Louisiana, including Alexandria, Broussard, Cankton, Carencro, Duson, Lafayette, Larabee, Long Bridge, Maurice, Milton, Mire, Monroe, Morgan City, New Iberia, Scott, St. Martinville, Youngsville, and other communities in Lafayette Parish.